A group of UK marshals have been coming out to Jersey every year since 2000, when 12 of us came to assist with the competitive element of the Festival of Motoring and hillclimbs, which has now grown to be the Jersey international Motorsport Festival. At least 3 of that team still assist with the marshalling of the Jersey international Motorsport Festival. All of the marshals who come and assist on the two events run by CVMRC are MSA registered. This means they are all trained, there is a training and grading scheme run by the MSA and every marshal to maintain their grade must attend a training day at least every two years. We are trained in incident handling, fire, first on scene, communications and other specific areas of marshalling. All UK marshal are unpaid volunteers. Many of the marshals who attend the events in Jersey have been marshalling for many years most for over 20 years. Amongst the team who come to Jersey we have two racers, one races MX5s the other 2CVs, we have a few people who are licenced Clerks of the Course. Amongst our team we have people who have carried out every marshalling duty possible, this includes Post Chiefs, flags, incident, pits, startline, communications, safety car driver & safety car observer. Between us we have marshalled race meetings, rally’s, rally cross, sprints, hillclimbs & sporting trials. 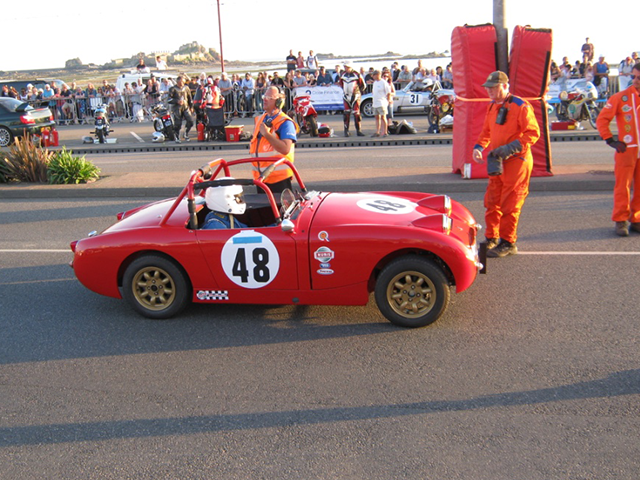 We have marshalled for cars, motorcycles, karts, trucks, soapboxes and almost everything else with wheels. Events that we marshal are very diverse, marshals you see in Jersey also attend, Formula 1 GPs both in the UK and abroad, all of the Goodwood events, World Endurance Championship, Touring Cars, Le Mans 24 hour, between us we marshal at every circuit in the UK including Silverstone, Donington Park, Brands Hatch, Rockingham, Mallory Park. Some of the places we have marshalled include Abu Dhabi, Bahamas, France, Belgium, Spain, Isle of Man. We all enjoy our trips to Jersey and look forward to them as one of the highlight of our year. We all like to enjoy ourselves whilst out and marshalling but when needed we all have a very professional approach to our marshalling. In Jersey it is great to be part of a small team who are all experienced and know how to handle almost every type of incident. In Jersey we are backed up by the Clerks of The Course, the stewards, the rescue unit (Normandy Rescue), recovery vehicles and medical crew. Over the years we have become friends with many of the officials and competitors and look forward to seeing them on our annual visits. We always receive a warm welcome and always look forward to coming back to Jersey. Anyone interested in marshalling either in the UK or Jersey please speak to any of the marshals you see or contact the BMMC (British Motorsport Marshals Club), details at www.marshals.co.uk , if enough people in Jersey decided to join perhaps there could be a Channel Islands division. For details of marshalling or helping with the CVMRC at either the Jersey international Motorsport Festival or Greve De Lecq hillclimb details can be found at www.classicandvintagejersey.co.uk . Enjoy your motorsport and stay safe.